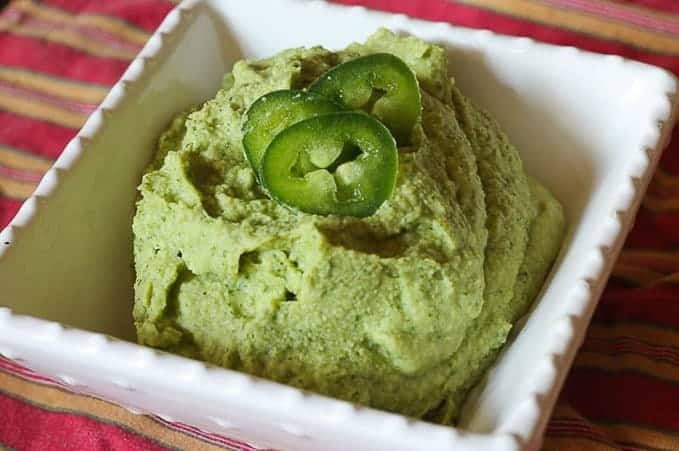 This delicious Jalapeno Cilantro Hummus Recipe takes only 5 minutes to make! This is a no tahini hummus recipe. Yum! Hummus. It is one of those guilt-free snack foods that tastes amazing and somehow sneaks in healthy proteins, vitamins, and nutrients. 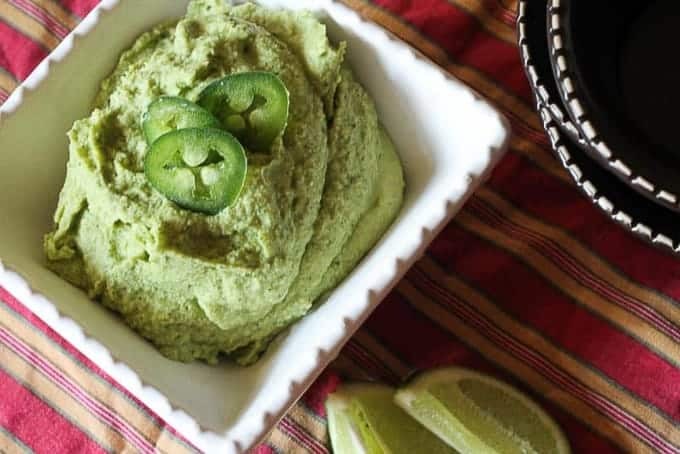 This Jalapeno Cilantro Hummus Recipe takes about 5 minutes to make and it is so much better than store bought hummus!
. I researched and researched for the best food processor after hating my last three processors. This one is PERFECT! It processes the food perfectly. It is powerful, sturdy, and well built. The blades meet the edges so little tiny pieces of food do not get stuck or missed. And it has a large food feed tube. It is one of my favorite appliances in the kitchen. This Jalapeno Cilantro Hummus is packed with power ingredients that does your body good. The garbanzo beans are a high source of protein and fiber. One cup of garbanzo beans have 15 grams of protein and 12.5 grams of fiber! Cilantro is a great source for antioxidants. It is also known for its detoxification properties that are very helpful for cleansing out toxic minerals in your body. It is also known to lower cholesterol and blood sugar levels. Jalapeños and limes are a rich source for Vitamin C and other antioxidants. When you whip this tasty dip together, you can feel good about doing it. So go ahead and make this hummus, take a big bite, and share the love. You are going to love it. And when you do, I told you so! I don’t use tahini in this hummus recipe. I only like tahini in some hummus flavors. In this recipe, it would overpower the flavors. This is perfect for those who do not like tahini or who want to save a little extra calories in their snacking. It is very delicious either way! *Cooking Note: homemade Hummus is great for dipping, but it is also fabulous as a substitute sandwich spread! Try using it in place of mayo or ranch and see how you like it. If you like this recipe, check out: Fresh Hot Jalapeño and Garlic Relish , Jalapeño, Cilantro, and Lime Brown Rice, and Citrus Infused, Honey and Jalapeño Chicken Yakisoba Stir Fry . Check out this easy step by step video tutorial on how to make jalapeno cilantro hummus in the recipe card below. Serve with bread, chips, or vegetables. You cannot beat a 5 minute recipe, I love the sound of this… So many great flavours! I love homemade hummus, but this cilantro jalopeno variation is definitely going to become a favorite. Heading to the store to get everything I need! I love this recipe! I am excited to try this and serve with bread. Thanks for sharing. What a great new spin on an old favorite! This will be perfect for #TacoTuesday! Sharing all over the place! Mmmm! Cilantro and jalapeno with hummus? Yes please! I love your suggestion of using hummus as a substitute for mayonnaise… so much healthier! This sounds wonderful and the added health benefits are perfect for a protein fibrous health nut like me. I also love hummus on sandwiches and this one has such great flavors that I can already think of lots of sandwiches I would want to have it on. Thanks for sharing the recipe! Thanks Dorcas! I love cilantro too! It is one of my favorite herbs. I hope you like it!!!! I love this recipe because I love cilantro and it gives me yet another reason to use it:) plus what’s not to love about hummus. Great recipe, thanks!